Selected Contents. Plenary session. Structure of liquid/liquid interfaces studied by ellipsometry and Brewster angle microscopy (G. H. Findenegg et al.). Assembly of organic and inorganic molecular layers by adsorption from solution (T. Kunitake, I. Ichinose). Scattering study of the lyotropic lamellar phase in aqueous solutions of nonionic surfactants (T. Kato et al.). Microemulsions composed of metal complex surfactants, bis(octylethylenediamine (=OE)) Zn(II), Cd(II), and Pd(II) chlorides, in water / chloroform and water / benzene systems (M. Iida et al.). Fine particles and colloidal dispersions. Science and art of fine particles (E. Matijevi&cacute;). Hydrothermal synthesis of nano-size ZrO2 powder, its characterization and colloidal processing (O. Vasylkiv, Y. Sakka). Supramolecular organized films. Mechanistic study of model monolayer membranes and their interactions with surfactants: correlation to effects on CHO cell cultures (C. Yang et al.). Nanostructure and dynamics of polymers at the interfaces by neutron and X-ray reflectometry (E. Mouri et al.). Nanostructural solid surfaces. Improved molecular models for porous carbons (J. Pikunic et al.). Condensed phase property of methanol in the mesoporous silica (S. Kittaka et al.). Industrial applications and products. High performance thin lithium-ion battery using an aluminum-plastic laminated film bag (T. Ohsaki et al.). Surface reactions of carbon negative electrodes of rechargeable lithium batteries (Z. Ogumi et al.). The purpose of this Conference was to discuss the results of recent developments and the future prospect in science and technology of the field. The field has been growing and flourishing, while indicating many problems to be uncovered and solved. The conference was structured to encourage interaction and to stimulate the exchange of ideas to accomplish the above purpose. • Industrial Applications and Products. The Conference comprised 2 plenary lectures, 42 invited lectures, 150 oral presentations and 266 poster presentations. 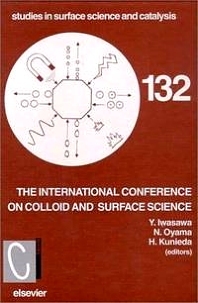 For scientists working in the field of colloid and surface science in research and applications.